© 2005, Kevan Hashemi Open Source Instruments Inc. 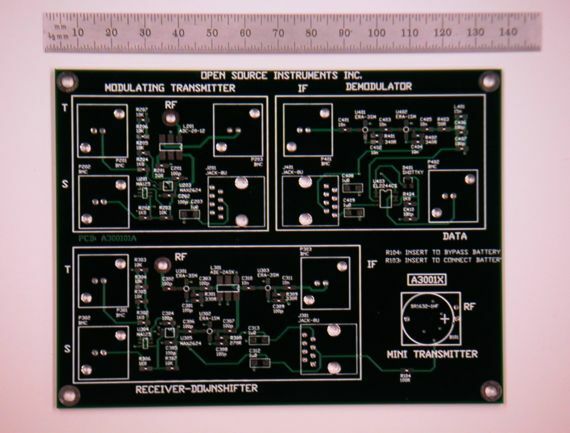 The Subcutaneous Transmitter Test Board (A3001) is a collection of four test circuits onto one four-layer printed circuit board. The Modulating Transmitter (A3001A) provides BNC connections to the TUNE and SHUTDOWN inputs of a MAX2624 voltage-controlled oscillator (VCO). The output of the VCO travels through a directional coupler to an antenna. The directional coupler allows us to look at reflections from the antenna base. When we are not looking at these reflections, we terminate the directional coupler output with fifty ohms. The circuit runs off an external 5-V power supply. The Downshifting Receiver (A3001B) provides BNC connections to the TUNE and SHUTDOWN inputs of a MAX2624 VCO. It amplifies the signal picked up by an antenna, and mixes this signal with the output of the VCO. The mixed signal is amplified and passed out through a BNC connector. To look at the intermediate freqency (the signal whose frequency is the difference between the antenna and VCO frequencies), we put a 150-MHz low-pass filter on the IF output and feed the filter output into a scope. The circuit runs off external 5-V and 15-V power supplies. The Miniature Transmitter (A3001D) is a self-powered circuit 18 mm square and 8 mm high. It obtains its power from a 3-V Lithium battery. The battery powers a MAX2624 VCO, and the output of the VCO goes directly to an antenna. The Amplifying Demodulator is designed to take the low-pass filtered intermediate frequency output from the Downshifting Receiver, amplify it, clamp its amplitude, and then convert changes in the intermediate frequency into a voltage. We have not tested this part yet. The circuit runs off external 5-V, 15-V, and -15-V power supplies. We never used this circuit, because the far superior A3005 took its place. Here are the four pages of the circuit diagram. Here are the files that describe the printed circuit board.